There’s a saying: “When you love what you do, you never work a day in your life.” The challenge for most of us is finding a way to earn a living doing what you love to do, and then keeping it fresh so it doesn’t become “work.” I am very fortunate that the profession of eye care is an ever changing field. It keeps me inspired in my practice. Over the last 60 years, soft contact lens technology has constantly evolved and improved. We now have incredible contact lens products that provide visual solutions for those who have astigmatism, extremely high prescriptions, dry or sensitive eyes, and even those who wear bifocals or progressive lenses in their glasses. These days, I rarely have to tell a patient that they are not a “candidate” for soft contact lenses. One area that continued to be a challenge until recently was the use of contact lenses to provide visual rehabilitation for patients who have corneal diseases such as keratoconus, pellucid marginal degeneration, or scarring from a prior injury. All of these conditions cause the cornea, which is the clear window on the front of the eye, to become irregularly shaped and distorted. 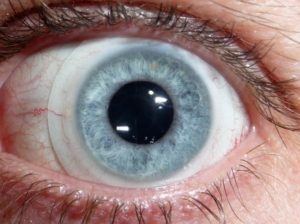 Many patients with distorted corneas are not able to obtain clear vision with glasses or traditional soft contact lenses because of the type of blur that is created. Imagine the frustration of not being able to drive or work comfortably because of distorted vision or glare. 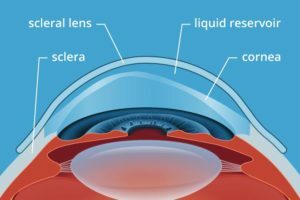 The only option in the past that would provide functional vision was rigid gas permeable (RGP) contact lenses, or some sort of hybrid lens that combined soft and gas permeable lens technology. The challenge with RGP lenses has always been comfort and wearability. Our patients could see well, but they often could not count on their lenses to be comfortable for the drive home. So, how do we obtain the clear vision of an RGP lens but with the comfort of a soft contact lens? Enter scleral lens technology, and in particular, the Zenlens.